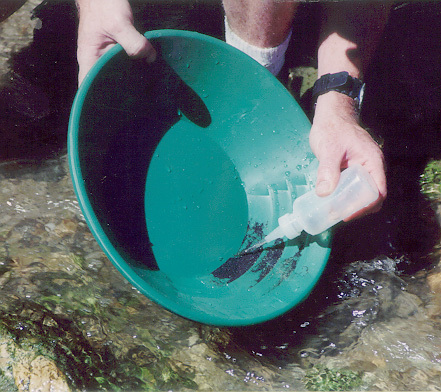 Before you actually start to process your first pan full of material, look around for the best location for panning. Select a spot where the water is a minimum of six inches deep and flowing just fast enough to keep the muddy water from impairing your vision of your pan and a place where you can sit down comfortably. 1. 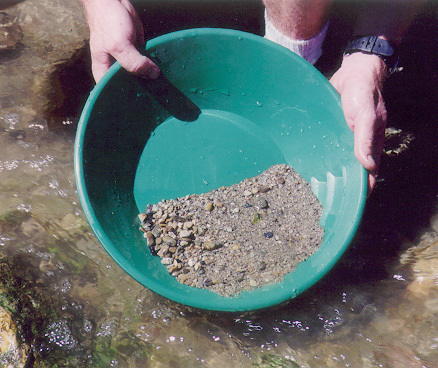 Fill pan 3/4 full of gravel, then submerge it deep enough so it is just under the surface of the water. Give the pan several vigorous shakes back and forth and from side to side, but not too vigorous as to wash material out of the pan. 2. Change from the shaking motion to a gentle circular movement, so the material starts revolving in a circle. This process will cause most of the dirt and clay to dissolve and wash out of the pan. If roots and moss surface, work them over your pan with your fingers to dissolve any lumps. 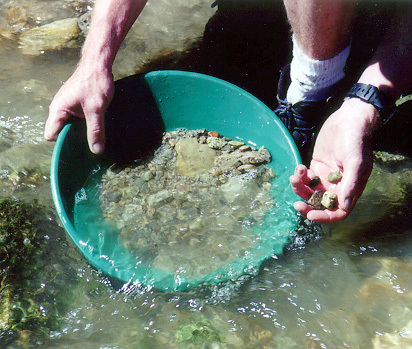 Pick out the larger rocks after making sure that they are washed clean. 1. Hold the pan just under the water and tilt it slightly away from you. Begin to swirl the water from side to side, with a slight forward tossing motion. Take care, but with sufficient force to move the surface and the lighter gravel out over the edge of the pan. 2. Leveling the pan from time to time and shaking it back and forth will cause the light material to come to the surface and the gold to settle to the bottom. An item that is considered a necessary part of a panners equipment is a panning sieve. The sieve sets over the pan and can screen or classify the larger cobbles, making the panning process much easier. The sieves are available in sizes from 1/4 of an inch (4-mesh) to a 100-mesh size screen. 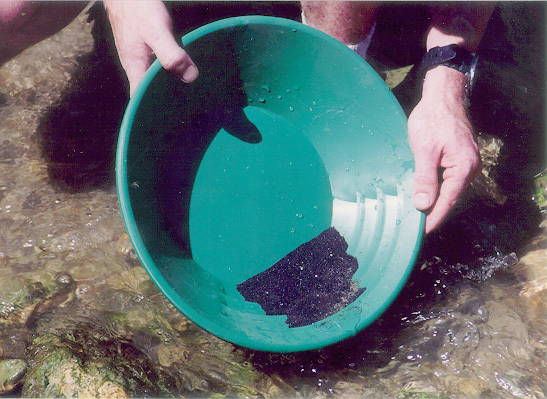 The gold pan sieves are most popular with the medium size pan and are available in most prospecting stores that sell gold recovery equipment.